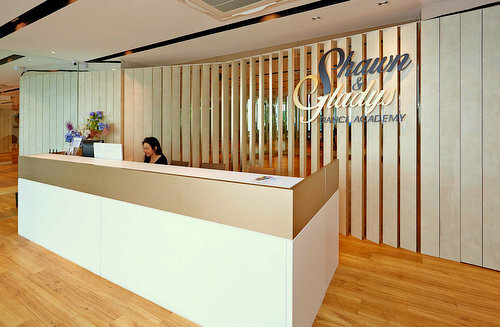 Dance studio Shawn and Gladys Dance Academy operates within Singapore’s Bras Basah Complex, at 231 Bain Street. Founded by former competitive dancers Shawn and Gladys Tay, Shawn & Gladys Dance Academy is one of Singapore’s top dancesport academies. The dance academy offers children’s and adult’s group and private classes, as well as social, latin, standard/ballroom, show, wedding, fitness and corporate dance classes. For the classes and dance education, all ages of customers are welcome and no previous dance experience is required to participate. In total, Shawn and Gladys Dance Academy has three beautiful dance studios filled with natural light and state-of-the-art AV equipment, with each studio having shock-absorbent dance floors, full-length mirrors, ambient coloured lighting and full acoustic sound systems. In terms of dance styles, you can participate in classes featuring mambo, rock ‘n’ roll, merengue, salsa, bachata, waltz, tango, Viennese waltz, foxtrot, quickstep, samba, cha cha, rumba, paso doble, jive, Latin fitness, yoga, body conditioning, and showdance. The official Shawn and Gladys Dance Academy Facebook page is available at www.facebook.com/shawnandgladys/. You can also follow the dance academy’s official Instagram account, which in turn is located at www.instagram.com/shawnandgladys/.